The pleasures are the same as they've always been--the constant possibility of learning something new, the chance to get a story on the page in a way that touches others, the delight of turning through the pages of your own story in your own mind. Writing is like reading, except that you get to spend ever so much more time and get to go so much deeper than you ever can as a reader. The challenges are much more intense, and require a clarity of decision-making thoughtfulness that's honestly a bit rare among creative people. More than ever we need our critique partners and editors, our truth-telling friends and the discipline to really learn the craft. It's a lot more challenging to have to juggle social media along with writing, and because often writing a blog post or a Facebook post can feel like work, the real work doesn't get done. Creatively, it's the best and freest time I've ever seen--which is exhilarating to me both as a writer and a reader. Who knows what gem I might discover as a reader? And who knows what I can do if there are no limits to my genre-mixing or storytelling madness? "Remember, you are always writing your backlist." Which is a reminder to always, always, always do my very best work. I'd pass it on. No alteration necessary. I love the writing itself. Making up stories and characters, diving into worlds I don't know and exploring them. It's just so much fun. Although I've learned to cope with it and have become comfortable teaching and meeting new people, I'm actually very shy. I love and relate to Daenerys Targaryen as much as any character I've loved, ever. My phone calls me Khaleesi. ;) Family and friends, Joan Wilder from Romancing the Stone. 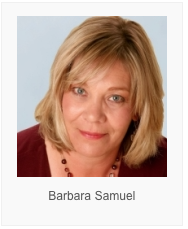 Barbara (Samuel) O’Neal sold her first novel in her twenties, and has since won a plethora of awards, including two Colorado Book Awards and seven prestigous RITAs, including one for THE LOST RECIPE FOR HAPPINESS in 2010 and HOW TO BAKE A PERFECT LIFE in 2012. Her novels have been published widely around the world and she travels internationally, presenting workshops, hiking hundreds of miles, and of course, eating. She lives with her partner, a British endurance athlete, and their collection of cats and dogs, in Colorado Springs. Her most current works are The All You Can Dream Buffet; Going the Distance, a series of New Adult novels written as Lark O’Neal, and Writing Romantic Fiction as Barbara Samuel. "a character who interests me and a story hook that keeps me turning pages to find out what is going to happen." That's what I look for in a good read, too. (And try to do in my own writing.) I enjoyed Barbara's take on the challenges that face writers today, and her advice to always remember you are reading your backlist.